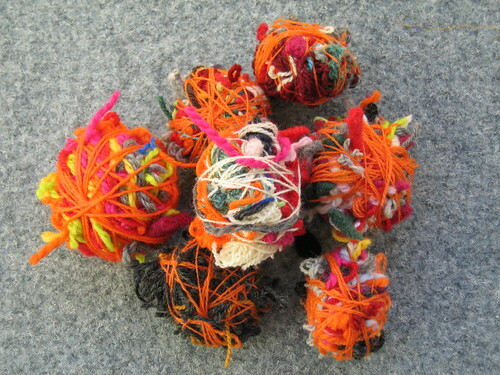 What do you do with your bits and pieces of wool-yarn? I needle felt them a little bit, before I throw them in the machine two or three times. For en strålende idé! De var jo både flotte og praktiske! Nysgjerrigheten drev meg raskt inn her. *flirer* De ble jo knallfine. Superflotte, så smart du er :) God helg! Wow, kule baller! Super måte å bruke opp tovbart garn på! Those are really cute and fun! oh wow, thanks for the idea, I will save my bits from now on! Det var rigtig smart - jeg sidder jo ellers sirligt og strikker "omslag" til sådanne bløde bolde og så bruger jeg netop alle mine små og større rester og afklip som fyld... dette her er da både lettere OG smukkere! These are great. 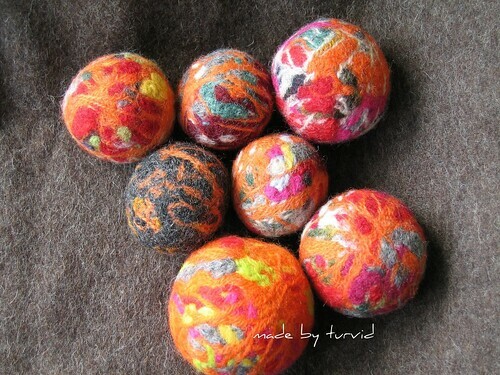 I've seen some similar balls recently in blogland but they don't use scraps but balls of yarn instead. I'm going to give this a go. Did you put them in anything before putting in the wash? Like a pillow or a net washbag? Absolutely amazing! You are so clever - what a great idea. i tried it last night and they fell apart in the washing machine! i think i should wrap them in some hosiery or a sock to keep it together until it felts. I just love them! What an ingenious way to use up scraps. Have to try this. Kjempegod idé! De ble veldig fine også! Blir de så runde av seg selv eller må de formes etterpå? For en artig måte å bruke trådrester på! Her går alt i søpla, men kanskje jeg må begynne å spare på dem isteden? Det er da bare en genial idé !! gorgeous! I'll have to give this a try with all those Noro scrapes I have been hoarding. I always collect them bits and pieces of yarns and wool and never thought of such a great idea! cool my kids will have new toys now, thanks! Welcome to my blog. I hope you'll like it. Find me on Ravelry as turvid.